Carpenter ants are pests that will enter your home because they are attracted to damp wood that resides there. They will burrow into this wood; wood that supports and beams to make up the infrastructure of your home. Obviously, this is not ideal as carpenter ants can severely damage the structural integrity of your home. While we did not have to worry much about these insects during the winter, warmer temperatures have now arrived and that means it’s time to do anything and everything you can to prevent these pests from entering your home. How can you do this? The first step is to know a little about carpenter ants in general. The second is to take a few simple precautions. Continue reading below to learn more about both. Carpenter ants are more active during the spring than they are during any other time of the year. They are able to reproduce and thrice when their environment warm. They do this by building their nests in damp wood wherever they are able to find it. Their nests can reside both indoors and outdoors, but will likely be located near other nests, with one of the nests being the “main one”. It can often be difficult to determine if you have a nest inside your home or if carpenter ants are simply entering your home from a nest outside of your home. Just because you see them inside does not mean that their nest is there as well or that you have a full-blown infestation. The only exception to this rule is if you saw carpenter ants in your home during the winter months. This indicates that you likely do have a nest inside, as these ants are unable to remain alive if their home is outdoors during low-temperature months. As you likely know, termites are similar to carpenter ants in that they will ruin the wood that makes up your home’s infrastructure. Unlike termites, however, carpenter ants do not eat the wood in your home. Instead, they burrow into it to create their colonies. Damp wood works the best for them as it is much easier to burrow into than dry wood. Outdoors, you will likely find carpenter ants in tree stumps, rotter logs, old sheds, or wood piles. Inside, they will look for any wood that has been damaged by leaks or condensation. Additionally, basements and attics make for ideal locations for carpenter ants. 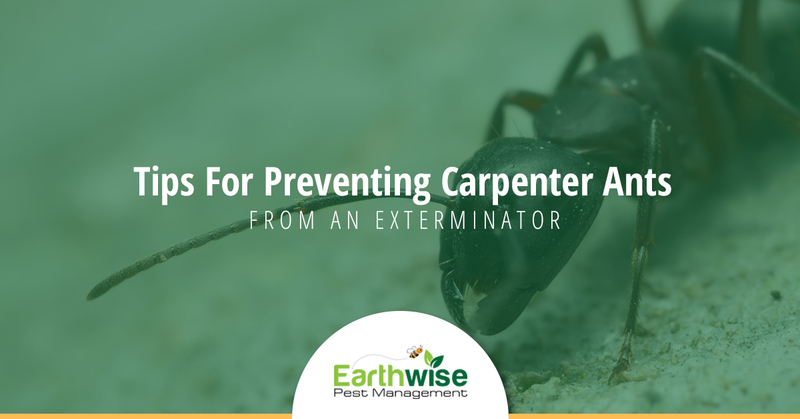 The best way you can prevent a carpenter ant infestation from happening in your home is to make sure there are no suitable places for the ants to build their colony in your home. This means making sure that the wood in your basement and attic are dry. You will also want to make sure that you do not have any leaking pipes in your home, whether they be in the walls of under your sinks. Additionally, make sure that if you store firewood at your home that it is away from the house so that if carpenter ants do occupy it, they won’t find their way indoors. Sometimes prevention unfortunately just isn’t enough. In the case that you already have a carpenter ant infestation, your best bet is to hire a professional exterminator in Sacramento. After all, the last thing you want is for the problem to get worse. At Earthwise Pest Management, we have the skills and the tools to get these pests out of your home for good. Contact us today to learn more about how we can help you!